TT92evo is the twin extruder with the highest power and widest range of final products, with a capacity of 1,2 tons/h of cereal based pellets snacks. It's equipped with a high speed premixer for a perfect hydration of flours, a large mixing vessel to let the dough a proper water absorption, vertical forced feeding screw to control the dough feeding to the cooking screw. The powerful variable speed motor is equipped with safety clutch, double cascade gearbox with high torque. Its particular design with long modular barrel and co-rotating fully intermeshing twin screws assures a proper cooking of the cereal based dough: the best combination between time, temperature and mechanical work input. After dosing the raw materials it starts the mixing phase, adjustable in accordance to the product needs. Thereafter comes the extrusion section. 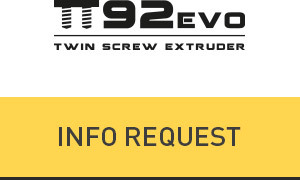 The TT92-evo extruder is a modular machine featuring segmented barrel, with different heating and cooling systems. They can be equipped with feeding port, steam/liquid injection port or venting port (atmospheric and under vacuum according to specific needs).